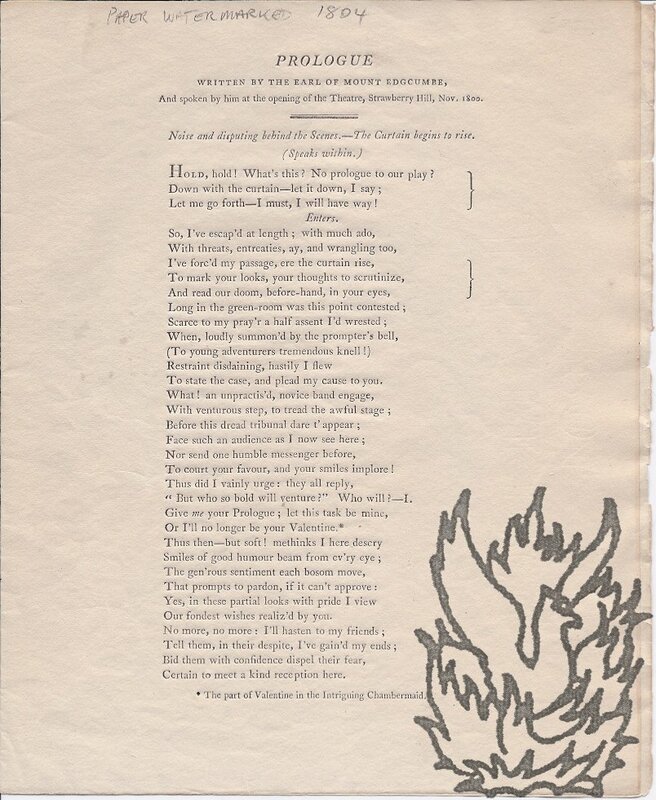 4to, 1 p. On bifolium of wove paper, watermarked 'J LARKING | 1804'. Nicely printed. Good, on lightly-aged paper. The poem is thirty-four lines long, beginning 'Hold, hold! What's this? No prologue to our play? | Down with the curtain - let it down, I say; | Let me go forth - I must, I will have way!' It is preceded by title and 'Noise and disputing behind the Sccenes. - The Curtain begins to rise. | (Speaks within.)' Footnote concerning 'The part of Valentine in the Intriguing Chambermaid.' Lady Theresa Lewis notes, in her edition of Miss Berry's letters and journals (1865) that in November of 1800 'Mrs. Darner indulged in the favourite amusement of private theatricals, on which occasion Miss Berry, her sister, and her father took part.' 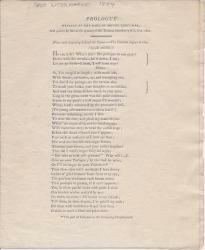 See Hazen, Strawberry Hill Press, Detached Pieces, 94. Copac lists only three copies: one at Edinburgh, and two at the British Library (of which one is listed as on unwatermarked laid paper, and the other on wove paper watermarked with date 1804).